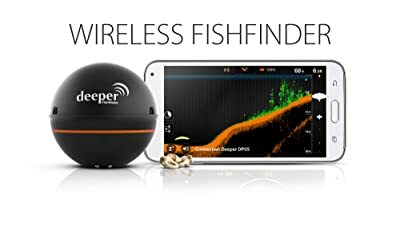 Deeper DP0H10S10-P Wireless Sonar Smart Fish Finder Review – What Makes It Special? Built to perform perfectly in both fresh and salty waters, as deep as 1.5 ft (0.5 m) to ~130 ft (40 m) below the water surface. Built in smart imaging technology makes sure, you get the best view of underwater. The castable device with mounting solutions, guarantees an access to the places where no fisherman would have gone before. Receiving all the sonar readings on your smartphone, gives it an edge over other such devices. A handy gadget like this one, at such an affordable price makes it the one, on your priority list. Way it operates:It requires no cellular data to operate, thus it can be functional anywhere. A Handy device:Its light in weight and manageable enough with the weight of 0.22 pound/ 100 gram and 2.6-inch/ 65 millimeter diameter. Wireless Technology:Once attached to the fishing line, it starts to gather all the relative information. And with the advanced wireless technology, you can get the info where ever you go. Dual Beam Sonar:Dual beam technology makes fishing clearer and you will get a better idea of what happening deep down under the water or boat. Temperature Sensors:Water temperature often faces timely fluctuations that does affect the process of fishing. 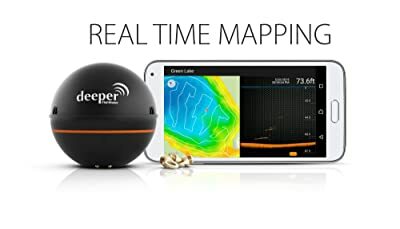 The inbuilt temperature sensors in Deeper, keep you updated of the underwater temperature. And you are always prepared for the suitable biting time. 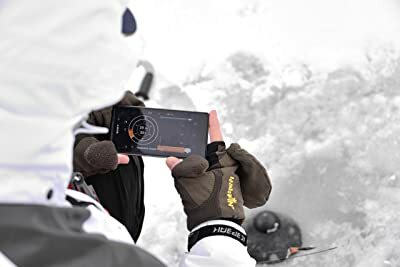 Compatibility:Smartphones and tablets that have integrated Bluetooth technology and operating systems; Android 2.3+ and iOS 5+, are best compatible with deeper fish finder. Fish activity calendar:A lunar calendar that presents all the activity of the targeted specie underwater. Camera function:The device has a high definition integrated camera that stores the underwater images handily. Updated weather reports:Keeping oneself up-to-date about weather conditions is yet another important point. Deeper mob app is functioned to provide you with all the weather updates in the vicinity for as long as five forthcoming days. Fishing log:The app has an easily customizable fishing log that you can use or transform the way you feel better. MapsOnline:Maps facility is perfect to plan a fishing trip. Online maps give you best info regarding the waterways across the area. Social Media sharing:Share your adventurous fishing experiences with others. Share it directly from this app to the sites like Google+, Facebook, Twitter. Other options:You may choose and change between a number of languages given in the app. Even sonar frequencies and unit systems can be selected from the options. Storing Data:No fear of losing any particular data. Whatever you want can be stored in Cloud services. 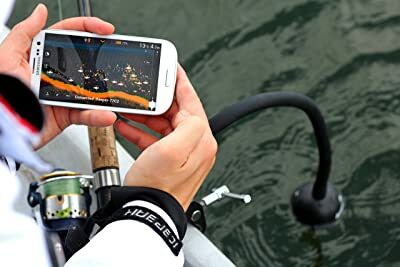 Sonar Display:It can operate a professionally designed sonar display to plan the whole fishing activities. Data history:The free app has the ability to keep your history of past 15 minutes secured. 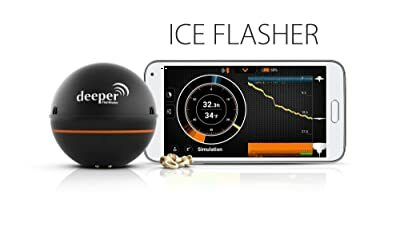 Size: This small ball-like fishfinder is just 2.55 in / 6.5 cm in size. Weight: 0.22lb/ 100grams and 2.6″/ 65mm diameter. This weight specifies Deeper, as far smaller and lighter for handling, when compared to other such devices. Connection: Bluetooth technology makes it more portable and handy. No fuss of wires. 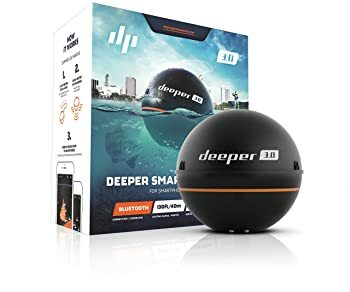 Range: The area the portable sonar covers is up to 140-160 ft / 50 m.
Depth: It can function as deep as 130 ft / 40 m.
Battery: Li-Poly. With a good battery timing of 4 consecutive hours, the battery is Rechargeable. Dual beam: 290kHz(15Degree),90kHz(55Degree). Dual beam technology gives the images, sent by Deeper, a highly exceptional quality. Mini pouch to carry the relevant stuff while going for fishing. User manuals to guide you well for each step. Quite handy and easy to manage. Especially when paired to the smartphone. The app offers great features. The info gathered through it makes biting effortless. Great battery performance keeps the work going. Wireless style makes it simple. Both home and car chargers would make recharging easy all the time. Swapping the battery, once its cycles are fully discharged, is the biggest disadvantage. As you can’t do it yourself. Only a certified technician can do it. Which seems tricky. It would have been best if the owner was allowed to change the battery. What about the quality of reading while the boat is moving? Its fine as long as it’s not too much accelerated. If it is, use a flexible arm (to use with boat) which is easily available. Is the battery easily replaceable? Can it be adjusted in front of a kayak? Easily! With a flexible arm. It depends on the device. With wall adapter around 1 to 1 1/2 hrs. And 12v car charger takes about 2 hrs. For a really happy fishing, Deeper is the best choice. Even if you do not have a boat, it will work greatly. Knowing the whereabouts of the species you are looking for, is the sole option for catching a prey. And no other device does it better than Deeper.